Improving your health with some breathing exercises: sounds cool, no? This is what promises Dr. Buteyko’s therapy. Konstantin Buteyko was a Russian doctor. In the 1950s, he put into theory a relationship between the amount of breathing and the state of health: the more you breathe, the worse your health. From this point, he thinks that this phenomenon can be reversed: could we improve (by diminishing) breathing in order to restore health?! After several trials on many patients (including himself, as he was seriously ill), his theory was apparently confirmed and the results were very promising: asthma, hypertension and other disorders would improve through his breathing exercises! Except that… all the great doctors of that time, who used to recommend to breathe deeply, had no intention to look stupid because of this heretical discovery. That’s why his studies were stopped, and he was forbidden to publish anything or even give a single conference. Despite severe repression, Dr. Buteyko managed to continue (undergoing heavy pressure and threats) to heal thousands of people with his miracle therapy. In 1983, his method was finally recognized by the Russian Health Ministry (that’s 25 years later). Of course, it will not be applied because the conservative medical body took care of it, and hid it under the carpet. The great pontiffs of conservative medicine possess such a power that this method remains today very controversial and still unexplored: the studies on the subject remain scarce. But I will leave this controversy aside for a moment (yes, I’ll come back to it!) so that we can look more closely at this famous theory on which Buteyko based his breathing exercises. Because if some breathing exercises can improve health, it would be really stupid to miss out on it! This means that the more CO2 in the blood, the better oxygen reaches organs and tissues. This correlation has been established since 1904. What Konstantin Buteyko did is to relate these parameters to the respiratory rate: breathing too much reduces the amount of CO2 in the blood, which prevents oxygenation of the tissues. For more information on this mechanism, you can read my article about hyperventilation. 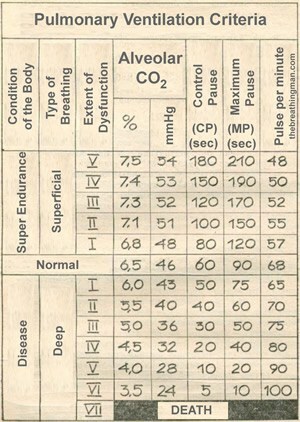 Buteyko Breathing Chart: Pulmonary Ventilation Criteria. Correlation of control pause (CP) and other parameters with alveolar CO2 and patient health. Based on this theory, breathing exercises intend to transform tense, deep and rapid breaths into conscious, shallow, slow, and relaxed ones. The first step is common to most breathing methods: learn to breathe calmly through the diaphragm. Only then are introduced the reduction of the respiratory volume and the breath holdings. It would be a problem of training: the more you hyperventilate, the more your body becomes “resistant” to CO2: the slightest lack of oxygen in the tissues will trigger the need to breathe. If you train your body to breathe less, it will adapt and tolerate higher (and therefore more beneficial) CO2 levels. Using this theory, one could suppose that asthma is actually a body defense mechanism: you breathe too much, and asthma tries to make you breathe less. Similarly, when sleep apnea is taking place, hyperventilation has lowered too much the level of CO2 in the blood: the apnea refills the CO2 by blocking the breath. When exercising, the energy produced by the muscles causes the CO2 to increase in the blood (hence the need to breathe more to evacuate it). Thus, exercise is beneficial because it helps us to tolerate a greater quantity of CO2 (among other benefits). It is also often observed that athletes breathe more calmly and are able to hold their breath for longer than most people. Conversely, when sick people undergo some physical exertion, it is usually the breath that runs out first (before the muscles!). When breathing too much and too deeply, it is usually the rib cage that regulates the breathing. Why? because the lack of CO2 tries to stiffen the diaphragm in order to make us breathe less. Chest breathing can then you bypass this mechanism. When you have a bad diet, the body is generally too acidic (lower pH) and must get rid of the excess of H+ ions. Since the quantities of CO2 and H+ ions are directly related, hyperventilating is one of the solutions that can lower the quantity of H+ ions, which mean increasing the pH back to its normal levels. Hyperventilation could be a direct consequence of poor diet. The above theories are not necessarily true, don’t take them for granted. Instead, it makes us wonder about the mechanisms of the body, which I consider important. Well, I could keep on for hours on that subject but I do not want to stretch the article too much. On the one hand, it is easy to show that the Buteyko method lacks evidence. On the other hand, it is obvious that no laboratory would like to see such a therapy take place. There are very few studies on the subject, but there is no study either to prove that it does not work. Eventually, this is not an isolated case: most “alternative” solutions face the same problem. That being said, when you search for Buteyko on the web, you often feel like you’ve been trapped into some business website, and free information is not that easy to find. I really think it’s a shame, even suspicious, and it surely doesn’t help spreading the method. I will not draw any conclusions, except that this method deserves to give it a try. It would be a shame to miss out on it just because the detractors have done their job too well. That theory is a very controversial one, and it is pretty hard to know what it is worth. Anyway, starting by learning to breathe calmly through the diaphragm is always a good thing and I think everyone should do it. As for the rest, many monks and / or yogi practice similar exercises (like breath holds) and they may at least bring a meditative aspect. There is no danger or money to spend… (unless you want to) So, what are we waiting for? I’ve already started practicing the exercises: I will detail them in a next article, and I have much feedback to give you very soon. Stay tuned! Edit – here are the breathing exercises. And you, what do you think of this theory? Leave me your feelings in the comments! The purpose of the Buteyko method is to normalize (or improve) your personal unconscious breathing pattern 24/7 so as to provide respiration in accordance with internationally accepted medical and physiological norms. Practically speaking, the method is designed to eliminate chronic alveolar hyperventilation (or too much breathing) and to restore the normal balance between carbon dioxide and oxygen in the lungs, blood and all cells. Here he was given his chance to establish a functional diagnostics laboratory where he conducted clinical studies on nearly 200 people, both healthy and sick. Over the next ten years of the laboratory’s existence, Buteyko and his team were able to obtain extensive information on the basic functions of the human organism – whether healthy or diseased. The laboratory was equipped at the highest level. There was a compendium of over forty various instruments capable of simultaneously registering almost all basic functions of the human organism, and producing approximately 100,000 pieces of data per hour. Analysis of this information was done on computers, mathematically deriving physiological measurements and the various conformities of the body’s processes. When the first data, various measurements, association, deductions, correlations, regulations, etc., were obtained. All of these confirmed the correctness of Buteyko’s discovery. Two hundred medical specialists were trained in the laboratory, most of whom, by the way, had suffered from one condition or another and successfully treated themselves with the method. Soon they were all treating other patients utilising Buteyko’s method. Official statistics showed that as at 1 January 1967 more than 1000 patients suffering from asthma, hypertension or stenocardia had been successfully treated and had totally recovered from their illnesses. Q: There are many medical studies indicating that acute hyperventilation produces asthma attacks in asthmatics. However, several studies found that acute hyperventilation with CO2 enriched air also results in asthma attacks. Therefore, as some doctors claimed, low aCO2 could not be considered as a single cause of asthma. Is this opinion correct? In all cases, these asthmatics breathed normal air with about 0.04% CO2 concentration. Thus, before the attacks, the following physiological changes were repeated many hundred times: abnormally hard work of the respiratory muscles, increased air flow through the respiratory tract, increased amplitude of pressure variations in internal organs, etc. All these changes, before the attacks, were sensed many hundred times by the millions of nerve cells of the nerve system. Finally, further lowered aCO2 and some other factors produced additional bronchoconstriction and the attacks. Now, exactly the same asthmatics arrive in the laboratories, where they perform the same acute hyperventilation, which is accompanied by all these described additional features (again sensed by the millions of nervous cells) with one difference, the inspired air is CO2-rich. Such air has never been experienced by these asthmatics before, but the whole nervous system learned that such a situation causes bronchoconstriction. What would be the result now? The result due to the changed stimulus would be defined by how much of the previous stimulus is left. Low carbon dioxide already created many chronic abnormal changes. Finally, some other triggers which cause the attacks can also be at work when the person deliberately hyperventilates, even with a temporary increase in carbon dioxide stores. It was not a sudden drop or increase in carbon dioxide stores that causes or prevents asthma attacks, but those chronic changes which affect every cell of the respiratory tract in asthmatics. Therefore, since less than 1% stimulus is absent (low CO2), while the remaining 99% is left, the reaction would be exactly the same, as for the whole stimulus. But assuming that the human nervous system is incapable of learning from the previous experiences repeated hundreds of times and that all these events sensed and recorded by the nervous system did not produce habituation and conditioning, one can assert that low carbon dioxide is not the cause of asthma. Therefore, even in conditions of artificially increased aCO2, the influence of so many areas of the nervous system should be more powerful, than that of the breathing center. Meanwhile, if such tests with CO2-rich air were repeated many times, the effect of gradual relearning can be observed and acute hyperventilation with CO2-rich air would not cause bronchoconstriction and the attacks. Moreover, physiological studies found the confirmations of this psychological effect based on the physiology of the nerve cells. It is known that, for example, some breathing maneuvers (chapter 2), e.g., Valsalva and Miller maneuvers, or breathing air with the same composition at the end of the breath hold, as in the lungs, extends BHT. Why? All previous life, movements of respiratory muscles resulted in the new oxygenated air coming into the lungs. Normally, the nervous system learned millions of times, that such respiratory movements are signs of new (fresh) air flow. When, all of the sudden, the conditions are different, only the breathing center creates the stimulus to breathe, while the rest of the nervous system is “happy” and does not contribute to the urge to breathe. “… asthma is a disorder which is investigated by thousands of respiratory specialists with millions of dollars worth of equipment to measure breathing. Yet after more than half a century of work by all these people measuring patients’ breathing, they haven’t picked up that asthmatics are just breathing too much” (Kolb, private communication, 2001). Previous Previous post: Chronic hyperventilation = chronic asphyxia!